A valuable collection of 100 of the biggest hits from this exciting musical era complete with access to orchestrated backing tracks so you can play them via streaming or download and sound like a pro. 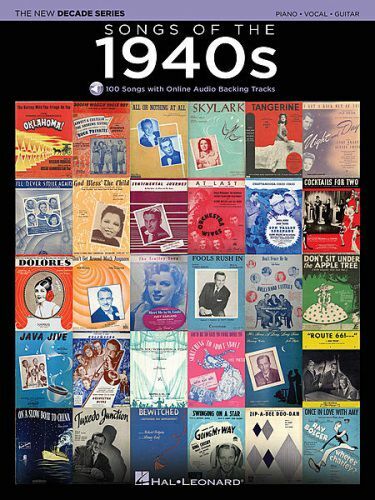 Songs include: At Last · Be Careful, It's My Heart · Bésame Mucho (Kiss Me Much) · Bewitched · Boogie Woogie Bugle Boy · Chattanooga Choo Choo · Do Nothin' Till You Hear from Me · Don't Fence Me In · Don't Get Around Much Anymore · God Bless' the Child · How High the Moon · I Get a Kick Out of You · It Could Happen to You · Java Jive · La Vie En Rose (Take Me to Your Heart Again) · Laura · Lover Man (Oh, Where Can You Be?) · A Nightingale Sang in Berkeley Square · Perfidia · Route 66 · Sentimental Journey · Skylark · Speak Low · The Surrey with the Fringe on Top · Tangerine · The Trolley Song · Tuxedo Junction · When You Wish upon a Star · You Made Me Love You (I Didn't Want to Do It) · You'd Be So Nice to Come Home To · Zip-A-Dee-Doo-Dah · and more.